How Bernie spent his millions was anything but revolutionary. What did $220 million buy? Ads, consultants, and a dispiritingly conventional campaign. 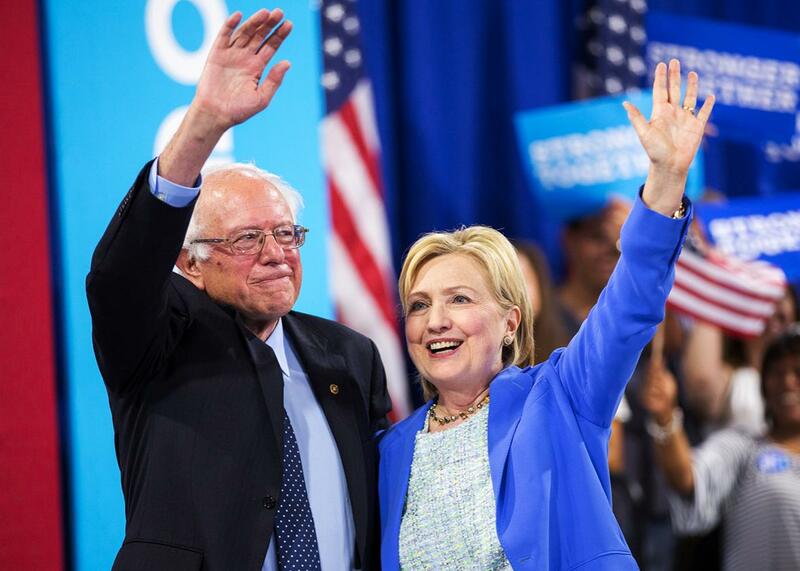 Presumptive Democratic presidential candidate Hillary Clinton and Bernie Sanders after speaking at a rally in Portsmouth, New Hampshire, on Tuesday. Bernie Sanders’ core pitch to Democratic primary voters was that his people-powered “revolution” would make him uniquely positioned to clean up a campaign finance system that most Americans see as hopelessly corrupted. On the strength of this appeal, Sanders raised more than $220 million, and almost 60 percent of those dollars came in the form of small individual donations. A recent analysis by the Los Angeles Times found that about $1 out of every $4 donated to Sanders came from people who aren’t in the workforce, including the unemployed or retired. Outside groups supporting Sanders have raised just $610,000, and the only super PAC to offer him significant support this cycle—$3,262,105—was National Nurses United, which is funded from union dues, not the checks of “millionaires and billionaires,” as Sanders put it on the stump. But what did that money buy, exactly? Where did all those $27 checks go? A close examination of public records and interviews with campaign finance experts and grass-roots organizers suggests that, in some significant ways, a campaign that took in money like folk bandits wound up spending it like drearily conventional pols. In April, the campaign had a burn rate of 143 percent, meaning it was spending nearly half as much again as it was bringing in. A great deal of that money bought a blast of commercials preceding caucuses and primaries across the country, one effect of which was to enrich a small group of Democratic consultants whose compensation is tied to media spending. Disclosure forms examined by Slate suggest the campaign contracted with a front company—possibly created to obscure who made what off the Sanders movement—and in one cozy arrangement, effectively shared a third-party vendor with a pro-Bernie dark money group. This approach had material, if largely unseen, effects on Sanders’ candidacy: Every dollar that went into broadcast ads, digital strategizing, or Democratic consultants’ pockets was one less for local campaign staff or get-out-the-vote efforts. Bill Fletcher Jr., a veteran civil rights activist who said he consulted with the Sanders campaign early on but was not directly involved afterward, told Slate that while “the Sanders campaign is a tremendous movement,” it was plagued from the beginning by a “top campaign brass that was very insular” and didn’t take strategic advice from long-time progressive organizers, including some with extensive experience within the communities of color in which Sanders struggled to gain traction. Fletcher doesn’t believe Sanders got into the race to win and thinks that running a campaign focused on shifting the center of gravity within the Democratic Party led to serious strategic errors along the way. Key among them was a failure to come up with creative ways to convert millions of supporters’ revolutionary zeal into an integrated campaign operation. Some of those errors are reflected in how the campaign chose to spend over $220 million in campaign contributions. The top-billing vendor among all candidates during this campaign cycle is Old Towne Media. Located in a residential home on a leafy suburban street in Alexandria, Virginia, Old Towne Media is, from all outward appearances, a black box. Incorporated as an LLC in 2014, it lists no employees, and its only clients this cycle have been the Sanders campaign and a small PAC supporting an Ohio gubernatorial candidate. A close examination of the Sanders campaign’s ad buys suggests that Old Towne Media is a front company for Canal Partners Media, a well-known media firm aligned with the Democratic Party. According to Federal Election Commission data compiled by Open Secrets, Canal Partners Media billed $45 million during the 2014 midterms, half of which came from the Senate campaigns of Mary Landrieu in Louisiana, Michelle Nunn in Georgia, and Jeanne Shaheen in New Hampshire, the only winner of the three. During this cycle, however, the company has taken in only $515,000 as of May 23. It appears most of its business was shifted into Old Towne, which billed the Sanders campaign $82,773,463 by the end of May. An examination of 5,800 Sanders ad buy contracts and supporting documentation found that one Canal Partners Media employee, Jeff Scattergood, and two partners, Barbara Abar Bougie and Shelli Hutton-Hartig—all three working as representatives of Old Towne Media—are listed on over 1,000 documents related to air-time purchases for the Sanders campaign. Keeping the different companies’ names straight appears to have been difficult, even for the people filling out paperwork for the ad buys. In one document submitted in February, Canal Partners Media was listed as the agent of the Sanders campaign requesting rates for television time from stations in Columbus, Ohio. “Canal Partners Media (CPM) and Old Towne Media (OTM) are separate companies. There is an overlap between two of the CPM Partners—Barbara Abar Bougie and Shelli Hutton-Hartig—and Old Towne Media,” Hartig told Slate in an email. Why create a front company at all? One possible explanation relates to another Canal Partners client: Friends of the Earth Action Fund, which made ad buys supporting Sanders in early primary states. Friends of the Earth Action Fund is a 501(c)4 organization, meaning it’s a “dark money” group that isn’t required to disclose its donors. FEC rules prohibit such groups from coordinating with the campaigns they support, but Canal Partners received $20,971 from Friends of the Earth Action; documents acquired by Slate confirm that Canal Partners Media staff made ad buys on behalf of Old Towne Media for the Sanders campaign. Campaigns and independent expenditure groups can use a common vendor, but they can’t coordinate in any way and the vendor cannot be a conduit for nonpublic strategic information. By the end of May, the Sanders campaign had spent over $87 million on media production and ad buys, according to FEC records—nearly 40 percent of the funds raised by the campaign. They have spent more on advertising than any other candidate in the 2016 cycle, according to the Wesleyan Media Project. Because of the pay structure of media buying, that yielded an eight-figure payday shared by two firms: Old Towne Media and Devine Mulvey Longabaugh. Tad Devine, president of Devine Mulvey Longabaugh and senior strategist for Bernie Sanders’ presidential campaign, at the campaign’s Vermont headquarters in March. 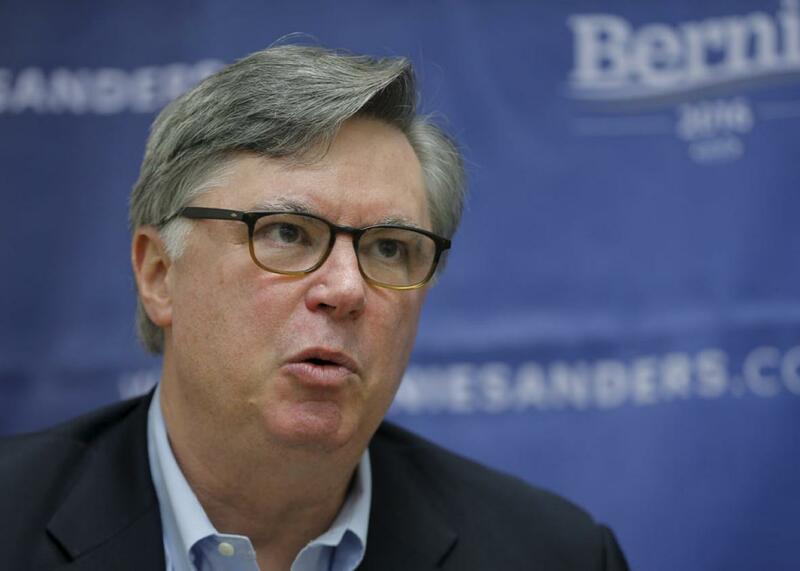 Tad Devine served as a senior strategist for the Sanders campaign and as president of Devine Mulvey Longabaugh. He was the campaign’s more establishment-friendly face, the Paul McCartney to campaign manager Jeff Weaver’s John Lennon. Unlike Weaver, whose entire political career had revolved around Sanders, Devine had more skin in Democratic politics than anyone else, perhaps even more than Bernie himself, having worked on a number of presidential campaigns—Al Gore’s and John Kerry’s among them. This cycle, Devine’s firm was paid just under $4.8 million for video and media production services and $438,403 for legal services. Devine also split a commission with Old Towne Media: Friends of the Earth Action is listed as a client of Devine Mulvey Longabaugh on the firm’s website. When it became an issue in 2006, Jane Sanders stopped taking commissions, and her husband’s campaign started steering ad buys through a firm called Abar Hutton, which was founded by Barbara Abar Bougie and Shelli Hutton-Hartig. Ten years later, Bougie’s name appears on multiple ad contracts for Old Towne Media, and the suburban house where the firm is located is owned by David Hartig and Shelli Hutton-Hartig, according to public records. Previous reporting on Devine’s share of the campaign’s ad buys have understated his take. “While he usually gets a double-digit percentage of a campaign’s ad spending, the veteran admaker is instead splitting a single-digit-percentage commission with the media buyers at Old Towne Media,” the Washington Post reported in April, summarizing an interview with Devine. But several hundred Sanders ad buy disclosures filed with the Federal Communications Commission and reviewed by Slate show the campaign consistently paid the industry standard 15 percent commission, meaning that Old Towne and Tad Devine shared at least $10 million in commissions through the end of May. Bernie Sanders proved that you can raise hundreds of millions from small donors and run a competitive campaign against a well-financed opponent who enjoys incumbent-like support within the party. But running a national campaign is a big, inherently institutional affair, and it turns out that it’s easier to run against the establishment and rail about its perfidy than it is to escape the habits of its campaign apparatus. The Sanders insurgency democratized fundraising in such a way, and to such an extent, that he could forswear the usual compromising relationships with super PACs and major donors. This was the nature of his revolution. But a presidential campaign, like any American institution, has structures in place to preserve the status quo. In this way, the Sanders campaign itself was a parable about the country it was trying to change.